The son of Obbo Tumsa Silga, Gudina Tumsa was born in 1929 at Boji in Karkaro, in the present administrative region of Mirab Welega in Ethiopia. Although Christianity was introduced to the community three decades before Gudina Tumsa’s birth, his nuclear as well as his extended family did not accept Christ as their personal savior until Gudina went to school in 1938. There he was converted to Christianity and started to preach the good news to his family as well as the surrounding community. Gudina’s first reaction to the traditional religion—the tradition that his parents had observed for many years—was to cut down the ritual Hommi Tree, a tree considered sacred by his parents and others who worshiped it. This action was widely criticized but Gudina faced his critics fearlessly. When he had completed fourth grade, he was sent to Nejo to the Swedish Mission’s school where pastors M. Lundgren and P. Stjärne were teaching. There he received an additional two years of elementary schooling through sixth grade. Gudina then went to Nekemte in 1945, where he completed eighth grade. He could not, however, afford a high school education; his only option was to look for a job, and he started to work at Tafari Makonnen Hospital as a gardener. He was later employed by the same hospital as a translator for foreign personnel who could not communicate with the local people in their native language. When the people of Nekemte recognized Gudina’s spiritual and leadership ability, however, they proposed that he go to Nejo for theological education in order to serve the congregation as their pastor. Gudina was twenty-six when he went to Nejo with his family. His training in the Bible School there took three years, from 1955 to 1958. He was ordained along with six other students on April 20, 1958, in the Nekemte congregation. After that, he served God as a full-time pastor. In 1966 Gudina also obtained a Bachelor of Divinity degree from Luther Seminary in St. Paul, Minnesota, after three years of study. In the thirteen years of his ministry that followed his return to Ethiopia, Gudina served as a parish pastor; synod organizer in Kambata, the southern part of Ethiopia; general secretary of the Ethiopian Evangelical Church Mekane Yesus (EECMY); and chair of the Council for Cooperation of Churches in Ethiopia. It was a turbulent period for the country. In 1974, Emperor Haile Selassie i was deposed and replaced by a Communist military junta known as the Derg and led by Mengistu Haile Mariam (b. 1937). Haile Selassie’s death in 1975 is thought to have been ordered or carried out personally by Mengistu. The Derg, which ruled Ethiopia until 1987, imprisoned and executed thousands of Ethiopians without trial. Gudina was one of the Derg’s many victims. On July 28, 1979, he was conducting a Bible study at the church in Urael, one of the EECMY congregations in Addis Ababa. After the church service, Gudina was kidnapped outside the church quarter together with his wife, Tsehay Tolessa, by unidentified plainclothes gunmen. Tsehay was freed immediately on the outer edge of the city but her husband’s fate was not known for thirteen years. Mengistu’s regime came to an end in 1987. After a period of civil war, a new government was established by the forces of the Ethiopian People’s Revolutionary Democratic Front in 1991. In the beginning of 1992, the mass media began to report the deaths of several religious leaders. Abuna Theophilos, the patriarch of the Ethiopian Orthodox church, and Shaika Taye Meshesha, the leader of the Ethiopian Muslims, were identified as having been murdered by the Derg in the late 1970s, in addition to Gudina Tumsa. At that time many people were looking for their lost friends or relatives who had been victims of the Mengistu government. The transitional government of Ethiopia publicly confirmed that Gudina had been brutally murdered by the Mengistu regime in 1979 and buried at a place called the Ras Kassa compound, or Kassa Gibi. The exact date of the execution is not known, only the year. Thirteen years after his abduction, Pastor Gudina Tumsa was officially declared dead on April 29, 1992, after his body had been exhumed from the place where he had been secretly buried in 1979. Written sources from Gudina’s own hands, however, are scarce. Many of his writings were casualties of war. Some of his books and personal papers were lost when the ship carrying them was sunk during an Israeli air attack on the harbor of Port Said in Egypt during the 1967 Six-Day War. In addition, all his sermons and other personal papers were lost, destroyed, or stolen after his murder when the EECMY office building was taken over by the Mengistu government in 1981. Gudina’s institutional leadership and theological thought began to emerge after 1959, when the EECMY was recognized as a legitimate church by the Ethiopian government. After its recognition, the church played major roles in the sociopolitical and economic aspects of the Ethiopian community. The church’s response to the famine in Ethiopia—which the North Ethiopia Synod presented to the General Assembly on April 23, 1973—and to the famine that struck Kambata and Hadiya in 1974 made history, in the sense that the church took the initiative in working to meet the country’s social and economic crisis. Gudina was influenced by a series of American and German theologians, particularly Reinhold Niebuhr, Martin Luther King and the civil rights movement, and Dietrich Bonhoeffer. Gudina’s theology was not a vision but a process of transformation, as with Bonhoeffer who called to repentance a church perverted by and compromised under the Nazi regime after 1933. Gudina’s ministry in Ethiopia, however, led him to stress the “contrast between the traditional African idea of life and the Western one.” Gudina called his theology “holistic” because he thought that the Western churches had lost the this-worldly dimension of human existence. At that time, Gudina consciously took up the theme of justice and demanded a change in the church’s salary scale: low salaries were to be raised and higher ones reduced. “Sharing with our brothers and coworkers whatever is made available to our church in the interests of the Kingdom of our God and Savior” was Gudina’s challenge to the institutional church. Gudina regarded the role of the church as a paradigm or model in advocating justice for the underprivileged. The church stands for the liberation of human beings from oppression, but with clear criteria: human rights, justice, the rule of law, and grassroots democratic participation. The church regards “its continuing task to be the full liberation of the whole [person]. It welcomes the opportunities which the new situation provides for building a more just society.” It understands self-reliance and land reform as decisive because it has itself taken action about them. In the concluding paragraph of Gudina’s last will, he states with crystal clarity that he was ready for the sake of the people to violate the laws of an Ethiopian government based on fundamental injustice. The church must set an example for the rest of society in its own life. Why was Gudina Tumsa murdered? He had been arrested twice before his murder, in 1978 and 1979. In the interrogations that followed his earlier arrests, Gudina was accused of participating in political resistance in the form of cooperation with the Oromo Liberation Front, a group formed in opposition to the Mengistu regime by members of the Oromo people, the largest ethnic group within Ethiopia. Gudina denied the charge. He was also accused of creating a forum for political opposition by founding for the first time in Ethiopian history a Council for Cooperation of the Churches, to which even the Orthodox church belonged. Gudina had sympathized with the general aims of socialism since 1975, but he rejected it as an intellectual ideology. 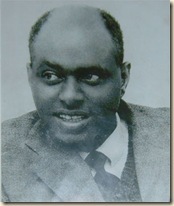 “Nationalism has its own place,” he said, “but it can never replace the Gospel of Jesus Christ.” At the EECMY’s General Assembly at Nejo in April 1976, he expressed the incompatibility of Christian faith with Marxist atheism only three days after the National Democratic Revolutionary Program of Ethiopia (NRDPE) had been proclaimed as the new “social myth” based on scientific socialism and a proletarian vanguard leading the revolution—a clearly Marxist-Leninist agenda. Samuel Yonas Deressa is Associate Professor of Theology and Global South at Concordia University in St. Paul, Minnesota, and co-editor with Sarah Hinlicky Wilson of The Life, Works, and Witness of Tsehay Tolessa and Gudina Tumsa, the Ethiopian Bonhoeffer (Fortress, 2017). Subscribe now to enjoy great content like this delivered quarterly to your door! 1. Eide considers 1932 the year of Gudina’s birth. See M. Øyvind Eide, Revolution and Religion in Ethiopia: The Growth and Persecution of the Mekane Yesus Church 1974–85, 2nd ed. (Athens: Ohio University Press, 2000), 59. Christian Krause used the same date in his presentation during the second missiological seminar held in 2003 at Mekanissa Gibii, the proceedings of which were published in 2009. I assume Gubina’s birthdate to be 1929. See my article, “The Rev. Gudina Tumsa: His Early Life and Ministry,” in The Life and Ministry of Gudina Tumsa, 2nd ed. (Addis Ababa: Gudina Tumsa Foundation, 2008), 4. Gudina himself gave his birth year as 1928 when he completed his registration form at Luther Theological Seminary in 1963 (GTF archive EI 01, vol. 1). Nevertheless, according to Gudina’s family, 1929 is the most probable date. 2. Wajira Silga, November 31, 1995, interview with Habtamu Bula. 4. Tsehai Tolesa, July 31, 2007, interview. 6. The date is calculated from the fact that Gudina was ten years old when he started school plus his six years of education (four years in Boji and two in Nejo) up to that point. 7. Tafari Makonnen is the birth name of Emperor Haile Selassie i (1892–1975). 8. Fekadu Kumera, A Historical Survey to 1980 (unpublished manuscript; Addis Ababa, 1988), 65. 10. Johnny Bakke, Christian Ministry: Patterns and Functions Within the Ethiopian Evangelical Church Mekane Yesus, Studia Missionalia Upsaliensis 43 (Oslo: Solum, 1988), 152. 11. Fekadu Gurmessa, The Central Ethiopia Synod (unpublished, 2008), 66. 12. The EECMY was formed in 1959 as the result of a merger of Lutheran and other churches established by missionary work in Ethiopia. Mekane Yesus means “House of Jesus.” The EECMY is a member of the Lutheran World Federation and currently claims almost eight million baptized members. 13. The Amnesty International report for April 1986 gives the date as July 23, 1979. 14. The Ethiopian Orthodox church, which had existed in Ethiopia for centuries and considered itself the indigenous form of Christianity in the country, had initially opposed recognition of the EECMY as a church, maintaining that it was only an “organization” that was led by Europeans. “Ethiopia” was the last part of the EECMY’s original name; it was called the Evangelical Church Mekane Yesus in Ethiopia” (ECMY) until 1978. See Eide, 54, 87. 15. Unpublished church officers’ minutes, 73–68, 73–86. 17. President’s report on the executive committee meeting, June 7, 1974. 18. Executive Committee Minutes, September 21, 1974. 21. Gudina Tumsa, “Serving the Whole Man,” in Essential Writings of Gudina Tumsa (Addis Ababa: Gudina Tumsa Foundation, 2007), 122. 22. Motivation for Policy Decisions by the Executive Committee (unpublished document), 1975, Doc. 6a, §6, WaD, 79. 23. Gudina Tumsa, “Pastoral Letter, The Evangelical Church Mekane Yesus in the Ethiopian Revolution,” in Essential Writings of Gudina Tumsa, 82. 27. Gudina Tumsa, “The Role of a Christian in a Given Society,” in Essential Writings of Gudina Tumsa, 11ff. 28. Motivation for Policy Decisions, §8, WaD, 79. Italics in original. 29. Tumsa, “Pastoral Letter,” 83. 30. The Oromo accounted for about 34% of the Ethiopian population as of 2012. 33. Excerpted from Emmanuel Abraham’s speech on the day that the bones of Gudina Tumsa were recovered, June 29, 1992. Emmanuel Abraham (1913–2016) is a colleague of Tumsa who served Haile Selassie as a diplomat from 1943 to 1959 and as president of the EECMY from 1963 until 1985. Abraham also served on the executive committee of the LWF from 1957 to 1984 as the EECMY delegate.